HISTORIC RALLYING ENTERS A NEW ERA! No more regularity tests, our events take you on glorious country roads, through breathtaking scenery, while testing your navigation skills (on maps) and your ability to keep your car reliable on tough roads and in all weathers. There's plenty to keep both driver and co-driver busy and good teamwork is vital. Both complete novices and highly experienced crews found Liège-Brescia-Liège 2008, 2010, 2011, 2012, 2013 & 2018, Micro Marathon 2009, XK-E Pyrenee 2014 and Mycenaean-Minoan Rally 2019 exciting and highly enjoyable - and, while in 2008 the LBL's Spirit category was won outright by one of the most experienced crews on the event, the Authentic category was won by a crew with minimal previous experience. You compete against similar vehicles in your own classes, so all have a chance to shine - and if you don't want to be competitive, you can still have great fun and enjoy the atmosphere of our unique rallies. 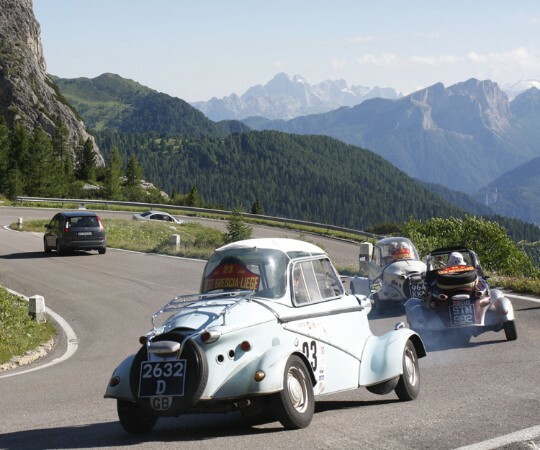 START preparing now to bring your Microcar on the Micro Marathon in the Pyrenees and northern Spain in 2020. JOIN US on THE CRAIC 2020 when we take Jaguar XKs and E-types to Ireland to sample all the wonders of the Emerald Isle, on a brand new rally that circumnavigates this beautiful island. SIGN UP for the MYCENAEAN-MINOAN RALLY 2021, when we take all classics to Greece, Kefalonia and Crete, taking in all the finest sights, roads, hotels and meals these delightful places have to offer! BOOK YOUR TR2 - TR8 NOW on Liège-Brescia-Liège 2019, which will be exclusively for Triumph TRs and is already booking up fast - or your MG - ALL models - on Liège-Brescia-Liège 2020.